In assessing the competitive position of a large online trader, we would use the five forces analysis of Michael E. Porter. The assessment would compare Amazon as an online bookstore against its online and conventional competitors. 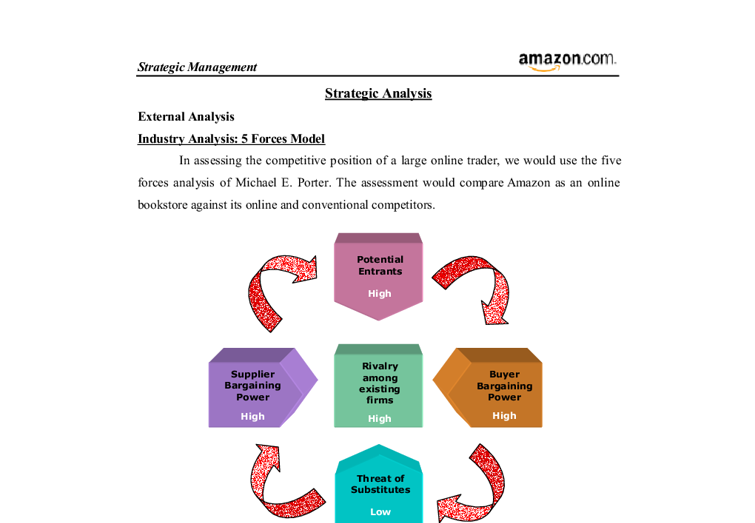 Strategic Analysis External Analysis Industry Analysis: 5 Forces Model In assessing the competitive position of a large online trader, we would use the five forces analysis of Michael E. Porter. The assessment would compare Amazon as an online bookstore against its online and conventional competitors. Potential Entrants The online bookstore industry that Amazon has pioneered in was, at first, very hard to penetrate. There were different barriers such as distributing capabilities and the variety of the selection offered that are supposed to be hurdled. Although it is relatively easy to set up an e-Shop, however e-Shops such as Amazon now have very sophisticated websites and considerable investment in their supply chain infrastructure. Amazon successfully solved these tricky parameters as being the first one to get into the whole idea of online retail. With being the first, they had the luxury to set what were the norms for the industry. Factors that may lower these barrier tactics would be a wider selection and the ability to go to an actual bookstore to exchange or return books or other products. This network of "actual" retail spaces makes it easier for the consumer to return or exchange the products they were not satisfied with. They also have brand name recognition (Amazon is currently the best recognized brand on the net). Setting up a large, general purpose, online bookstore and getting customers to know about that bookstore and to use it is not going to be easy and is not going to be cheap. These handicaps of Amazon were the basis for the emergence of book retail giants Barnes & Noble and Borders in the online shopping industry. Most of the large, conventional book retailers have now set up online bookstores. They had the advantage that they could use their existing supply chain arrangements to feed the online bookstore. They have not achieved the brand name recognition of Amazon. ...read more. Later, general managers for each store would be accountable for store-specific income statement that reflected both commerce related to Amazon's operations and commerce related to activities on Amazon's platform of third-party sellers � Outbound Logistics Although online business had more advantage than traditional retail store about real estate locations but it had to have some centralized distribution centers that pick and pack millions of unique product combinations and ship them directly to millions of customers' homes. Technology, process and competencies needed to run this operation differ fundamentally from traditional distribution functions. Estimated shipping dates of Amazon were based on several factors, including destination address, how quick it could obtain and assemble items for shipment, and whether the requested of customers that it minimized the number of shipment or ship items as they became available. Amazon calculated delivery estimates time by taking its estimated shipping dates and adding the time it took a package to travel from its facilities to customers' destination address. The ship rates were separated by domestic shipping rates and international shipping rates. Domestic shipping rates had 3 time rates: standard shipping (3-5 business days), two-days shipping, and one-day shipping. International shipping rates were divided by continents and had 3 time rates: standard international shipping (15-28 business days), expedited international shipping (7-14 business days), and priority international courier (3-7 business days). The expenses for shipping depended on distance and time. Amazon's deliveries were supported by many companies such as UPS, U.S. Postal service, DHL Worldwide Express, Airborne Express, FedEx, and Menlo Worldwide. � Marketing and Sales Through 1999, as the Internet continued to gather momentum, Amazon increased its commitments to new categories. As Amazon expanded, the private and public equity markets funded Internet-related companies to an unprecedented degree. After that, Amazon launched toys, electronic products, tools, software, lawn and patio and kitchen product, cell phones, and wireless services. In addition, it expanded overseas, adding dedicated sites for the U.K., Germany, Japan, and others. ...read more. It provides feedback around both the internal business processes and external outcomes in order to continuously improve strategic performance and results. When fully deployed, the balanced scorecard transforms strategic planning from an academic exercise into the nerve center of an enterprise. The balanced scorecard suggests that the company should view the organization from four perspectives, and to develop metrics, collect data and analyze it relative to each of these perspectives; Finance, Customer, Internal Process, and Learning & Growth. Key Performance Indicators (KPIs) Objectives KPI 1. Maximize Profit � Profit Growth � Return on Investment (ROI) 2. Increase Sales Revenue � Sales Growth � Sales Revenue 3. Increase Service Revenue � Service Sales Growth � Service Sales Revenue 4. Reduce Costs � Profit Margin � Costs per cup 5. Maintain existing customers � Numbers of Existing Customers 6. Increase new customers � Number of New Customers 7. Increase customers' satisfaction � Customers Satisfaction Index (Survey) 8. Faster Services � Service Time � Waiting Time 9. Increase lines of products and service � Number of product and service lines 10. Good Image � Customers Satisfaction Index (Survey) 11. Increase Market Coverage � Number of New Countries 12. Fast, Accurate, and User Friendly operating process � Service Time � Number of Failure in each process � Number of Complaints about Website Appearance and Using the Web 13. Open New Markets (DC + Websites) � Number of New Markets � Number of New DC and Websites 14. Improve Research and Development � Number of New Product and Service � Number of Process Improvement 15. Supplier Relationship Management � Supplier Performance � Total Material Costs � Number of new suppliers making contract with the company 16. Proficient Partners (Employees) � Performance Evaluation � Competency Testing 17. Technology Improvement � Number of technology course employee take � Amount of money invest in technology 18. Employee Training � Number of training hours per employee � Number of training courses 19. Employee Recruitment and Selection � Turnover rate 20. High morale and satisfaction from employee � Turnover rate � Employee Satisfaction ?? ?? ?? ?? 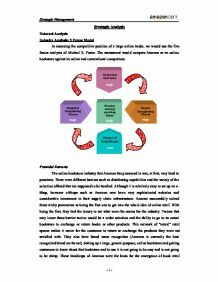 Strategic Management - 1 - ...read more. Businesses can easily build their website, which enables them to create a service online. Benefits of an online presence A web business presence have global "round" visibility which means they never close and are available from any location in the world at 24 hours 7 days a week. Video shop system - Feasibility Study. ticket from video, write user ID and date on it, put it in the 'on loan' file. 3.6 Return a video Find video ticket in the on loan file. Email Email is not a program which is downloaded but it is used when you are on the internet. Email is used to send messages to other people all around the world, also email is free all you have to do is just sign up and make an email address. fan base without the need to involve mainstream recording labels and this gives a lot of power to the fans. Very few aspiring musicians can get the chance to compete in the forum of reality TV, but everyone can get closer to their own favourite artists via a website. An explanation of the impact of availability of electronic information on individuals and society. How organisations communicate with individuals and society With the increasing use of the internet with 57% of the UK households having internet access, organisations are progressively more using "pop-ups" as a method of communicating with people. This has become for many an annoyance as it disrupts what the person was doing. It also may come in handy when filling in the application form as you could easily flick back and forward to refer to the advertisement when or if required. It also enables people/applicants to access to the advertisement 24/7 until the vacancy has been given to someone. show them the work, it can just be sent over and helped from there onwards. E-mails can be used for businesses to communicate such as sending invoices out to clients if the person is working at home for one reason or another. every arcade game released in the US, nine are released in Japan. The history of the Japanese arcade is very significant in the story of the decline of the American arcade, and in the shape of game design in general.